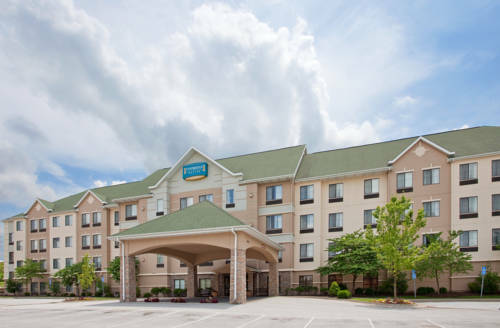 Welcome to Staybridge Suites Near HWY 63 & I-70 in Columbia - MO Conveniently situated near the University of Missouri - Staybridge Suites Columbia - HWY 63 & I-70 is in close proximity to both the University of Missouri Women and Children's Hospital. This newly renovated, pet friendly, upscale extended stay Columbia hotel provides easy access to the area's most important attractions and businesses. Ideally located near downtown Columbia Missouri this extended stay hotel is near the city's best shopping - dining and recreation. Located within eight miles of our Columbia accommodations travelers can tour or attend events at the University of Missouri or explore Rock Bridge Memorial State Park. In Columbia for an extended stay on business? Corporate guests of our convenient Columbia - MO hotel appreciate our lodgings near businesses such as Dana Corporation, MFA and State Farm. In order to best accommodate our guests' meeting needs - the Staybridge Suites Columbia offers a flexible conference room as well as a 24-hour Business Center and free high-speed Internet access. During your stay we hope you will take advantage of our Columbia hotel's complimentary services. A daily breakfast buffet - evening Socials - Fitness Room - Pantry - indoor pool/spa - library and guest self-laundry facilities are available and free of charge. We invite you to check out our excellent Columbia - MO hotel rates as you start planning your trip today. Childrens's program - Indoor pool and childrens board games such as chutes and ladders, candy land, battle ship, and many more. Meeting Room A: Meeting room can hold up to 40 People. It is 960 sq feet. We can set the room up however it is needed and can provide several different sources for food. Eagles Golf CourseEagles golf course is only 15 miles from our wonderful hotel. University of MO Veterinary Teaching HospitalAs a pet friendly hotel, we welcome patients of University of Missouri Veterinary Teaching Hospital.